Podcasting means many things to many people: self-expression, self-promotion, or even a career. Regardless of what you plan to do with your podcast, you must produce a quality show if you expect anyone to listen—especially given that there are more than 100,000 podcasts to compete with. This article focuses on audio podcasting. Remember that you’re creating a podcast, not a music album, so simplicity and voice quality are most important. Your audience needs to be able to understand you and your guests. This requires reasonably good equipment, good techniques, and good post-production. Most people listen to an audio podcast while doing something else; they are walking, running, driving, or working. They often want something to fill that time. Keeping that in mind, 30 to 90 minutes is a good bet for length. Here’s what you need to know to get started. To start a podcast, you only need a mic and your Mac. For software, you can record your voice with Apple’s $29 QuickTime Pro or GarageBand ‘08 ( ; part of the $79 iLife suite). But you need a mic that you can put close to your mouth. Your Mac’s internal mic picks up too much of the sound around you to be useful. I suggest picking up a USB audio interface and an XLR microphone (with XLR, you have more flexibility and potentially higher-quality audio than with a USB mic). My two favorite starter USB interfaces are M-Audio’s $130 Fast Track USB and Centrance’s $200 MicPort Pro, which is particularly great for travel. M-Audio's four-input Fast Track USB interface is small enough to take wherever you need it. Either option lets you choose from the literally hundreds of XLR microphones on the market so you can find the right mic for you. Frankly, you are looking for something that makes you sound good. The best thing to do is go to a store and try a bunch of them. If you don’t know where to start, your safest bet is Shure’s SM58 Vocal Microphone (about $100 online). It’s relatively inexpensive, has a solid sound, doesn’t require phantom power and is nearly indestructible. We have six of these mics and use them often for remote recordings. For a bit more, you can try Heil’s PR 40 ($325 online), which has a very clean, warm sound. If your podcast is going to have more than just you talking, you’ll need to mix everyone together. You can generally do this by using a mixer or capturing multiple tracks using a larger USB or FireWire audio interface. Through much experimentation, we’ve found Mackie mixers to be our favorites. They are solid, reliable, and quiet. You’ll need to buy a mixer with at least one auxiliary output (more on this later). The size of the mixer depends on the number of mics you need to mix together. If you get a mixer with six XLR inputs, you probably won’t ever need more. If you are thinking about more than six people talking, I suggest reconsidering. The optimum number is three or four people—you can include five or six if you need to, but shouldn’t ever have more people than that. On the road, I’ve taken to using M-Audio’s $450 Fast Track Ultra USB interface, which supports individual inputs that you can capture separately into Apple’s Soundtrack Pro 2 ( ; part of the $1,299 Final Cut Studio), GarageBand, or even QuickTime. By recording the tracks separately, you can address any individual issues later. Microphones and mixers themselves are only part of recording a professional-sounding podcast. You also need to consider how you use a mic and where you use it. Generally, mics sound best if you are within about four inches of the recording surface and speaking across them (if you speak directly into them, you will tend to “pop” your P’s). By getting up close, you can turn down the input volume and reduce ambient noise. 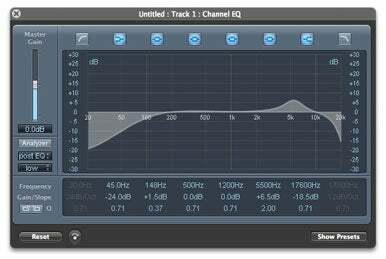 If you are not using a limiter (which protects your audio from peaking) your average peak should be around -12db to be safe. You can always increase the volume a little if you peak, but it usually sounds bad and is difficult to fix. On the other hand, if you make your recording too soft, you will mix in too much of what is often referred to as the “noise floor,” the spectrum that all the other sounds inhabit—generally sounds you don’t want. Remote Recording Of course, recording locally is only one option. Oftentimes, you might have one or more people in different parts of the country or different parts of the world. How do you bring them all together? The easiest way to do this is via Skype using Ecamm Network’s $15 Call Recorder. With it, you record yourself and everyone else on Skype to a QuickTime file. We regularly tie together people from around the world using this combination. If, however, you don’t have enough bandwidth to do this effectively, you have two options. You can use a box such as JK Audio’s $270 Inline Patch, which lets you record phone calls directly. Or, you can create what is called a double-ender—essentially everyone recording themselves locally and then uploading the files to you to mix together later. Double-enders tend to produce higher quality audio but are more work and more prone to error—if a person doesn’t properly record himself or upload the file, your podcast is in trouble. In the end, we’ve decided that, with a good connection, Skype can provide acceptable quality. The key is to make sure that the host is local and sounds good. In general, it is easiest to either record everyone locally or everyone remotely. Mixing and matching is doable but it takes a little more thinking. What you need to do is send the local guests’ output to the remote guests. Simple right? Here’s the rub: if you send the raw output back to Skype, your remote participants will hear themselves. So, how do you send the only the local folks’ output to the Skype folks while ignoring the Skype audio, but only for the remote folks? We call this a mix-minus, which means the mix minus the remotes. To set up a mix-minus, you use the auxiliary out of your mixer—essentially a separate track that you have independent control over. Making changes here won’t affect the final mix. So, you can turn the Skype track down in the auxiliary but leave it at full volume for the main mix. The people on Skype hear everyone in the office but not themselves while you are still recording everyone, everywhere. So now you that have your raw mix, the next step is to clean it up. There are many options, but let’s focus on the main issues. For us, the first step is to normalize the track(s). Normalization looks at the entire track, finds the peak areas, and then increases the volume so that the peaks are at the maximum level. This doesn’t really change the audio, it basically just makes it loud enough to fill the range you have. You can normalize (and do the other adjustments listed here) in GarageBand or Soundtrack. Using an application such as Sountrack Pro, you can adjust the equalization settings of audio podcast recordings to make voices clearer and easier to listen to. The next step is equalization. Hopefully you recorded some good audio, but many times it could be a little better—you need to focus on listenability. Women sometimes sound better recorded with a little more bass, while men often need a little less bass and a little more volume around 7k (7,000Hz) to make their words sharper. The final part is compression—reducing the variance between the highs and lows. Compressing brings everyone together in volume (you can often have some variance) and makes the sound more intelligible. Generally, you want to squeeze the audio together and increase the volume proportionately to make up for the adjustment. Two-to-one up to four-to-one are pretty good ratios. From there, you should export the file to AIFF to create a raw, full-resolution version for archiving. Then use iTunes to convert the AIFF file to MP3 or AAC. The benefit of AAC is that it allows you to add chapters and images for listeners using software such as Lemonz Dream’s $30 Podcast Maker 1.3 (version 1.1, ). You can add chapters in GarageBand or Soundtrack, but Podcast Maker is much faster and more predictable. Now, all you have to do is figure out how and where to distribute your masterpiece.